I haven’t had tacos in a long time, so I was very excited to make these. Instead of ground beef this recipe uses ground turkey, so you save a little on the saturated fat. 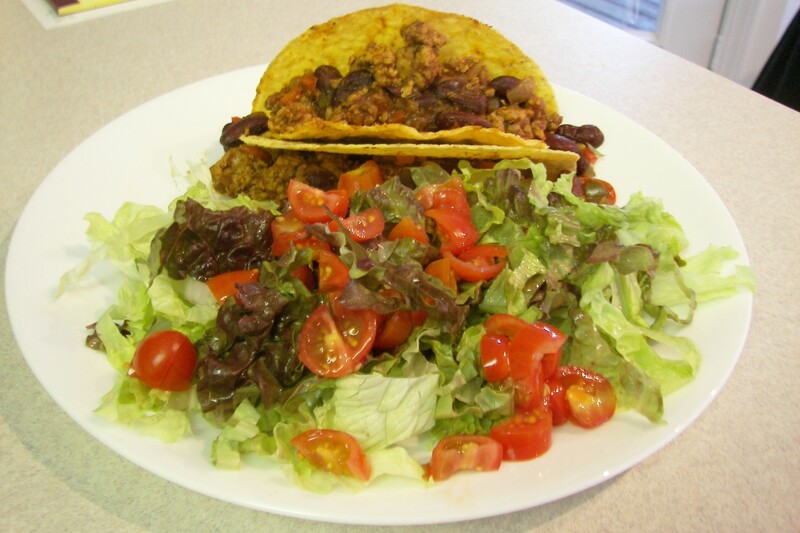 Plus this recipe adds beans, so there is more fiber and nutrients than regular tacos. Plus they are just super tasty! This recipe is from The Whole Foods Market Cookbook. In a large sauce pan heat the oil over medium hight heat. Add the turkey and saute about 5-10 minutes, until cooked through. Add the onion, peppers, garlic, chili powder, oregano, cumin, and cocoa powder. Cook about 3-4 minutes longer. Add the beans and tomato sauce. Simmer for 20 minutes. Serve with whatever toppings you like. This was one of my favorite meals this week, and my new favorite soup. The night started off rough when I realized I didn’t get everything I needed for the recipe, so I started substituting and winged it. It turned out very good! The recipe is adapted from The Whole Life Nutrition Cookbook, which is a great “real food” type cookbook (plus it’s all gluten-free, and dairy- free). Place all ingredients into a large 8-quart stockpot and bring to a boil. Cover, reduce heat to a simmer and cook for about 2 hours. Once turkey is done, remove and chop into bite size pieces. Saving the broth for the soup. In another 6 or 8- quart pot, heat the olive oil over medium heat. Saute the carrots and celery about 5 minutes, add the cabbage, thyme and sage. Saute about 1 minute. Strain the turkey broth into the pot and bring to a simmer, add the turkey and stir in the parsley. Preheat oven to 375F. In a small bowl mix all the ingredients together then place on a baking sheet or pie plate. Bake for about 10 minutes. Let cool slightly and then remove from baking sheet and place on a plate to cool. 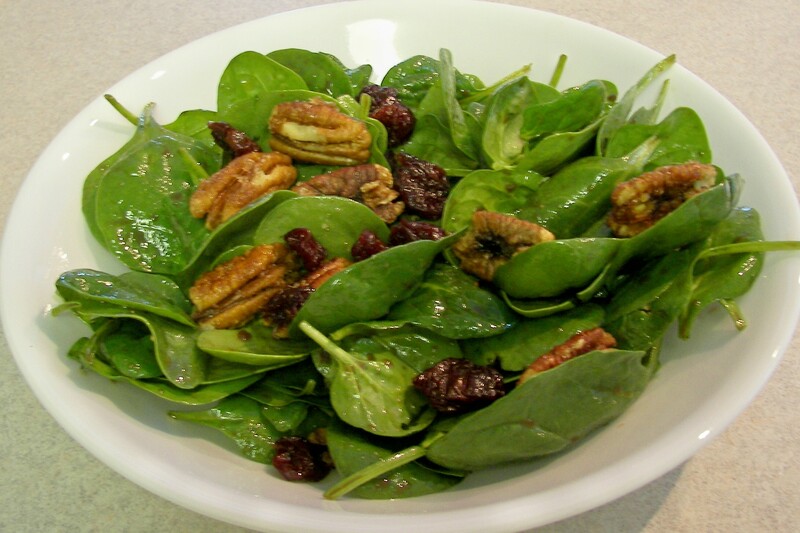 Place salad into a large bowl, add pecan and cherries. Whisk together the olive oil, vinegar, maple syrup and Dijon mustard, pour over salad and season with salt and pepper, toss well. This recipe is adapted from a Martha Stewart recipe. I ended up not doing the kebab part, it was much easier just to lay all the pieces out on the grill pan. It was a good recipe, not great, but good. In a large bowl, whisk together mustard, vinegar, oil and sugar, season with salt and pepper. Transfer 1/2 cup to another large bowl, add turkey and toss to combine. Cover and refrigerate 30 minutes. 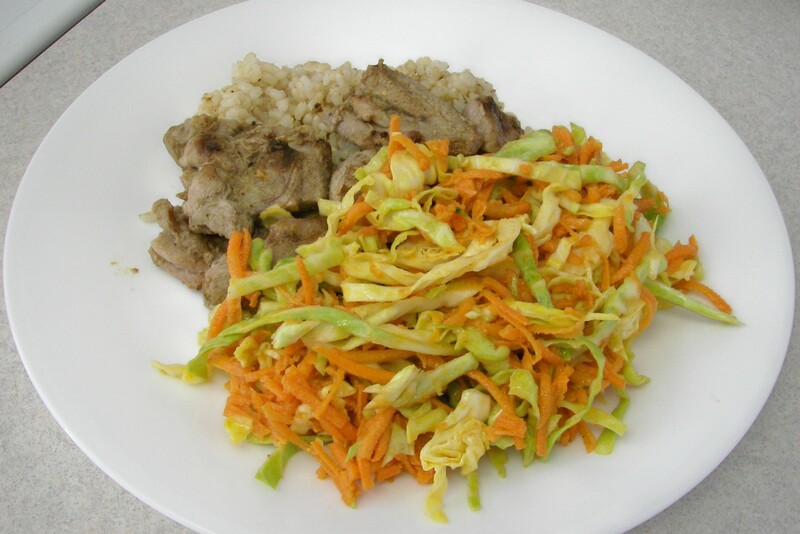 Add cabbage and carrots to the remaining mustard sauce, toss to combine and season with salt and pepper. Heat a grill pan over medium high heat, and grill turkey until cooked through. I served this with brown rice. This was a great way to use up leftover turkey. 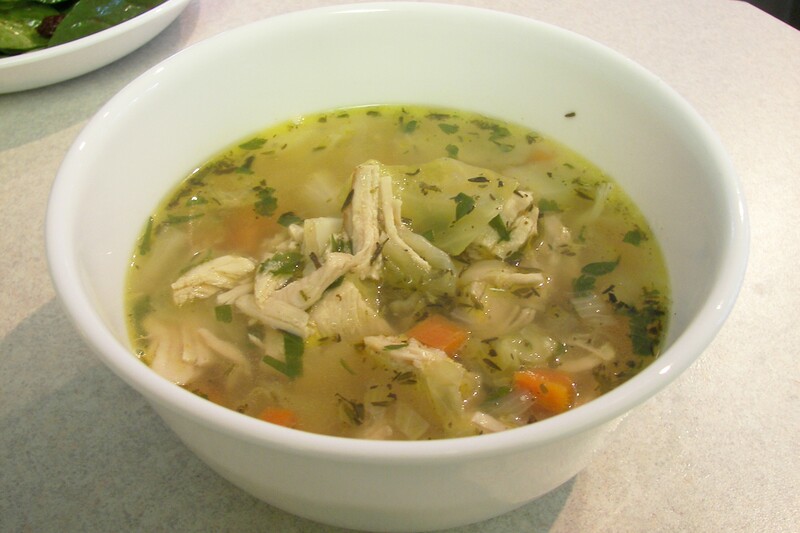 This simple soup was really yummy! This recipe was adapted from Whole Foods. Heat oil in a large pot over medium heat. Add garlic and onions. Cook, stirring often, 8 to 10 minutes, until onions are translucent. Stir in tomatoes, broth, oregano, ground chipotle pepper, cumin, black pepper, bay leaf and turkey. Bring to a boil, then reduce to a gentle simmer. Simmer 15 minutes to allow flavors to meld. Turn off heat, add cilantro. Serve topped with diced avocado and squeeze of fresh lime juice. I served this with white corn chips, roasted sweet potatoes, and a romaine salad with Mexican Lime Dressing. Whisk together and mix with chopped romaine lettuce. Sorry no pictures this time, which is too bad, this was a very pretty meal.